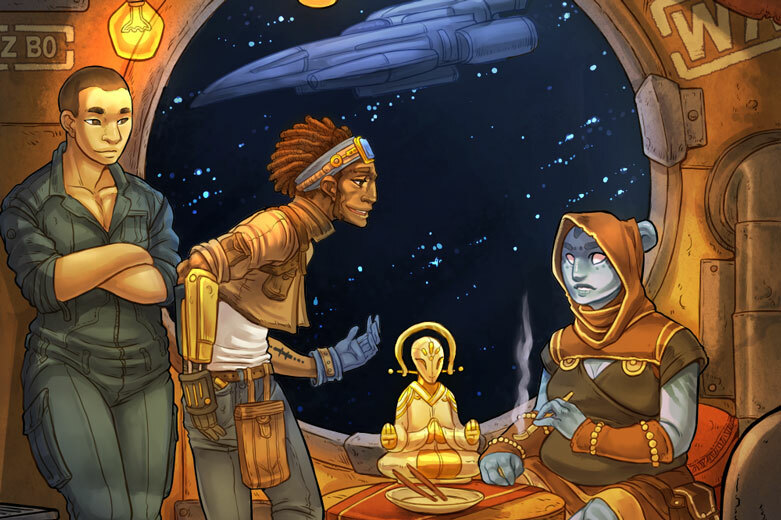 Flotsam: Adrift Amongst the Stars is an indie RPG that’s seeking funding on Kickstarter at the moment (and doing very well at it!). 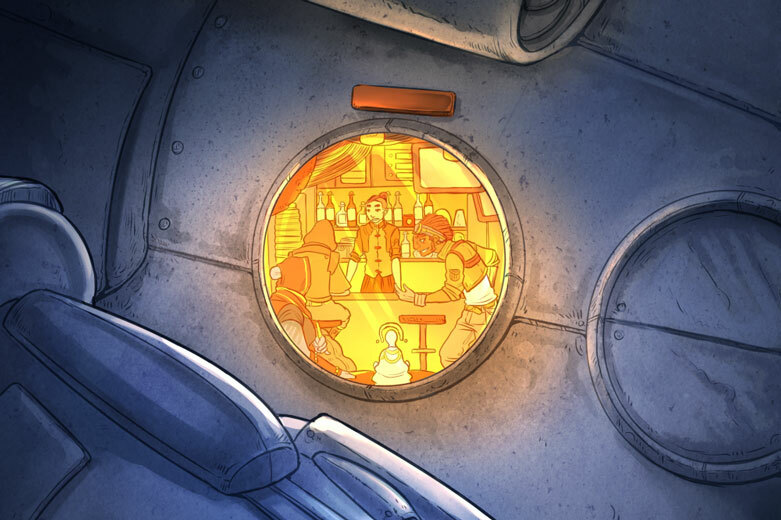 Designers Josh Fox and Becky Annison describe it as a game about ‘outcasts, renegades and misfits living in the belly of a space station’, and it’s for anyone who’s ever fallen in love with the grimier side of sci-fi. If you think Star Trek is too shiny by half or that Star Wars works out just too nicely most of the time, this is the game for you. Flotsam: Adrift Amongst the Stars is loosely based on a system first set down in the seminal Apocalypse World. This means it puts mechanical complexity second to collaborative storytelling and narrative control. The system has been refined heavily since, stopping off via games like Dream Askew and Hilltop to become entirely its own thing. 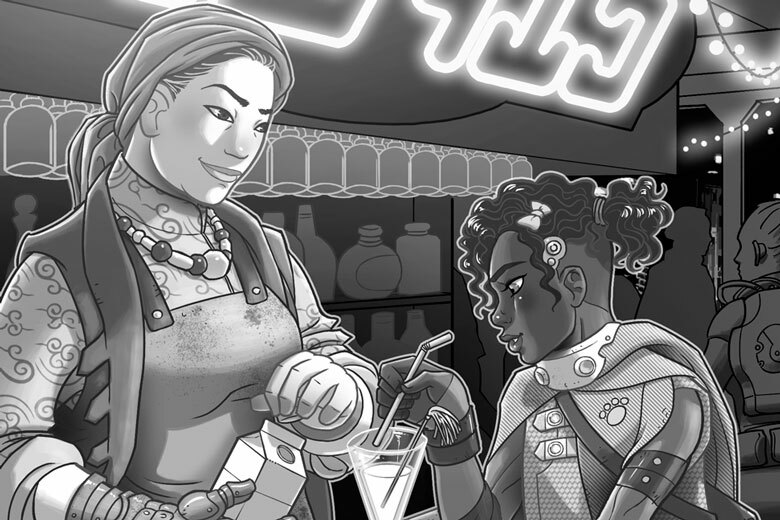 If you want a story about flawed characters making their way in an unforgiving world, Flotsam has you covered. Space opera, it is not. Where do we start? As with all RPGs, it’s easiest to talk about the stories Flotsam is going to evoke. If you like The Expanse, or Battlestar Galactica, you’re on the right track. Flotsam: Adrift Among the Stars is going to appeal to those who want a dose of humanity with their future. Truly great science fiction isn’t just about the technology: it’s about how people respond to it. Flotsam has that in spades. Your tale might see plague ravage through the undercity, or ask how tensions rise when a comet appears on a collision course. There’s a rich tableau to draw from, and that’s just in some of the scenarios suggested by the designers. Character classes, for want of a better word, are equally intriguing. Sure, you could play a disgraced doctor from ‘above’ if you want to. Or you could play as the hybrid’s meld of human and… something else. AI? Alien? God? Your call. You’ll actually be playing as more than one character, thanks to one of the game’s quirks. Although players will create a ‘primary’ character, they’ll be representing the world and its challenges just as often too. Sit down, traditionalists: there’s no GM. There are no dice in sight either. Both of those are conscious decisions that after some getting used to, we applaud. (And we like a spot of GM fiat and a well-handled d20). The lack of a GM actually makes it easier to make the story genuinely collaborative and improvisational. It takes the pressure off that player who always ends up behind the GM screen, too. By putting technology and numbers to the background, Flotsam lives true to the principles of classic sci-fi. It puts characters at the centre of the story. The oppressive pan-dimensional government and alien prophets living inside dying stars are just along for the ride. Whether they even exist or not is up to you – the game gives everyone the chance to shape the world, but forces nothing. The pledge for the digital version alone is just £9 (other currencies are available). That’s really not a lot of cash for a game that’s pretty unique, even amongst the wildly inventive indie RPG scene. Of course, it still has to be good. Thankfully, it ticks that box too. The project has already funded, and we’ve played with the draft rules so you’re as likely to see the final product as anything on Kickstarter. Josh and Becky’s previous game, Lovecraftesque, won widespread critical acclaim a few years back, so there’s pedigree here. Whether you plump for the PDF alone or a physical version the frankly brilliant artwork means you’re getting a gorgeous end product to boot. But more to the point, it’s a cool concept that the designers have taken real pains to make as accessible as possible. There are quick-start scenarios, and one-shot rules. There are even flowcharts to explain how the game works in practice. It’s a labour of love and it shows. The people of Flotsam’s tales live far below the lens flare of Hollywood’s’ vision of the future. This is a game that offers much more compelling stories of drama and conflict than that. And it’s got space ghosts in it. Flotsam: Adrift Amongst the Stars is funding until 9 August. For more information on the campaign, or to pledge, click here. * All images courtesy of Black Armada (https://blackarmada.com).